Some of the best food I’ve ever eaten – ever- was in Greece. I love Greece! And since the love of my life, hubby is Greek-American, we were not about to stop eating Greek food; we just needed to find vegan versions to keep that taste alive. 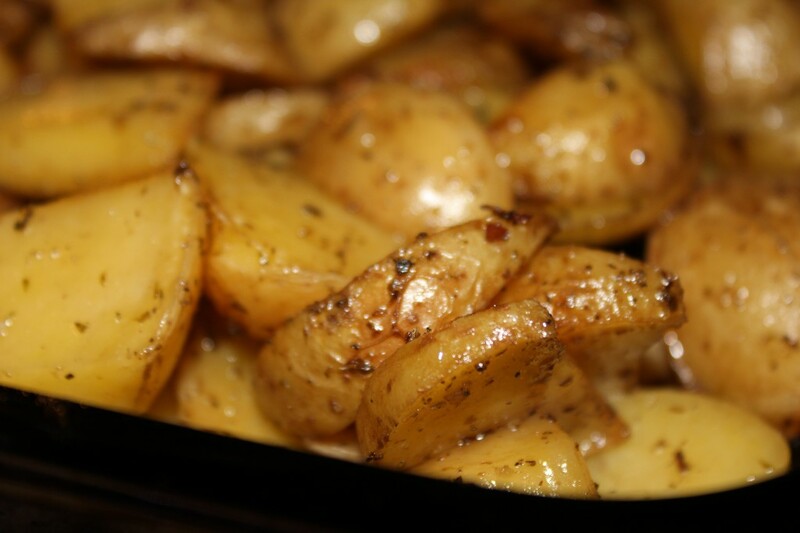 Greek potatoes are one of the easiest recipes to prepare vegan. As they bake, they make your whole house smell wonderful. I make a big batch and they don’t last long, even with just two of us. Preheat oven to 425 degrees Fahrenheit. Chop potatoes into bite sized pieces and layer evenly on a 9 x 13 cake pan. Combine all other ingredients in a bowl and mix. Pour the mixture on potatoes and stir to coat evenly. Cover pan and bake, stirring every 20 minutes until potatoes are soft and golden brown on the edges. This entry was posted in Recipes, side dishes and tagged gluten-free, glutenfreevegan.me, glutenfreeveganme.com, greek, healthy, Middle Eastern, potatoes, recipe, vegan, vegan cooking, vegan recipes. Bookmark the permalink. I love your website. MY daughter and I love vegan food and it all the time, but your website has changed my husband and sons mind about vegan food. love all the flavors you add!!! Thanks Colleen. Glad your family is enjoying the yummy vegan recipes! Your comment made my day! I love your Website!!! I am Greek ..and love love Greek Vegan food!! I have lost over 139 pounds in one year..eating Greek Vegan…. That is really amazing! I am married to a Greek a love all the wonderful flavors and spices. Some of the best veggies I’ve ever had were in Greece. Thanks for your comment and congratulations on getting so healthy!